A collection of iconic instruments used by artists including Jimi Hendrix, Jimmy Page, Metallica, the Beatles, the Rolling Stones and more are to be displayed at a new exhibition in New York next year. 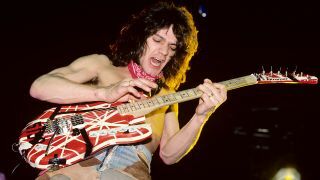 Play It Loud: Instruments Of Rock And Roll will run at the city’s Metropolitan Museum Of Art between April 8 until October 1, 2019, and has been organised by The Met in conjunction with The Rock And Roll Hall Of Fame. A statement reads: “Through more than 130 instruments that were used by such artists as Chuck Berry, The Beatles, Elvis Presley, Jimi Hendrix, Joni Mitchell, Jimmy Page, Steve Miller, St. Vincent, Metallica, The Rolling Stones, and many others, Play It Loud: Instruments of Rock And Roll will explore one of the most influential artistic movements of the 20th century and the objects that made the music possible. Among the exhibits will be Eric Clapton’s Blackie, Eddie Van Halen’s Frankenstein and Jerry Garcia’s Wolf, along with Keith Emerson’s Moog synthesiser and Hammond organ, and Keith Moon’s Pictures Of Lily drum kit. Scattered around the exhibition will be vintage posters and stage costumes, while music videos will also be shown around the museum. Also on-site will be a sculpture made from the remains of Pete Townshend’s guitars which he destroyed during a photo shoot with Annie Leibovitz for Rolling Stone.